King's Greenhouse offers a retail pricing service that allows our product to move directly from the delivery truck to your shelves, ready to sell. 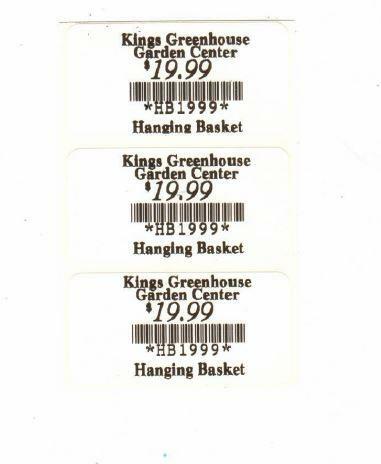 The service consists of printed sticker labels that include all the information needed for sale – your name, price, item number/bar code and, if desired, a brief generic description (for example: 4 ½“ Herb, Hanging Basket). We’ll pre-apply the pricing labels to your orders when they are delivered or deliver the appropriate labels with each order for you to apply on site. This service is available for King’s Greenhouse customers that meet minimum annual order requirements. Please contact your King’s Greenhouse Sales Representative for more information about the service and a quote. © 2019 King's Greenhouse. All Rights Reserved. Site produced by Clarity Connect, Inc.